The Yamaha CGS103 3/4Size Classical Guitar features a spruce top, along with meranti back and sides, delivering beautiful nylon-stringed tone. The 3/4 size scale length of 23” and a body depth of 4” make this a perfect guitar for children of elementary school age for are beginning their musical journey. Yamaha employs the finest available tonewoods with a rosewood fingerboard on a nato neck that will feel at home in your fretting hand. 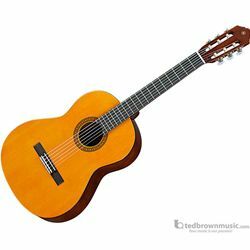 The Yamaha CGS103 3/4-Size Classical Guitar can serve as a fine transitional instrument for students nearly ready for a regulation-size, nylon-string classical guitar or even as a travel guitar.